Calgary 55 plus Games Association is an organization for mature Calgarians looking to play, compete, revitalize and re-energize by participation in up to 30 different sports, table games or cultural activities. Calgary 55 plus is a one-stop shop with something for everyone. We run summer and winter Games each year for Calgarians 55 years and older. We do not train people or hold regular leagues. Periodically Calgary 55 plus organizes Fun Days to introduce members to possible new activities and provides workshops/clinics for an activity where there is sufficient interest by members. Members compete in age groups. The actual number of age categories in an event depend on the activity and the number of participants. Most games, like cards, darts or Scrabble® have two age groups. Active sports can have up to seven age categories. For information about the activities you can enjoy as a Calgary 55 plus member, click here. Calgary 55 plus is all about active mature adults. It’s part of a provincial organization — Alberta 55 plus which is made up of eight Zones. 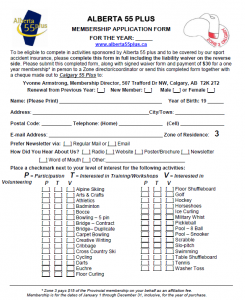 Calgary 55 plus Games Association is Zone 3 operating as a part of Alberta 55 plus. • Encourage, promote and develop recreation and culture opportunities. • Develop camaraderie among Calgarians 55 years and older. • Improve self-esteem, confidence and a sense of well being. lifelong fitness through active living – fun and friends lighten your heart! Membership is only $30/year and includes access to all Activities. New Members click here for information.